Nottinghamshire’s bowlers enjoyed a good workout in the spring sunshine as they dismissed the home side inside two sessions at Fenner’s. Samit Patel, Jake Ball and Luke Wood each took three wickets as Cambridge MCCU were bowled out for 148 in 53.1 overs. Patel took three for 21 during the middle of the innings. Ball, bowling with good pace and rhythm, removed both openers and finished with three for 26 and Wood bagged three for 31. Earlier, the county side had batted on before being bowled out for 565 in their first innings. Electing not to enforce the follow-on, despite a lead of 417, they made 231 for five, second time around, stretching their overall advantage to 648. Ben Duckett continued his fine form. The left-hander, who scored 216 on the opening day, made 82 from 52 balls in his second knock. Steven Mullaney weighed in with a hard-hitting 79 of his own, hitting 12 fours and three sixes. Notts batted on for 37 minutes at the start of the day before being bowled out. Luke Wood and Paul Coughlin extended their eighth wicket partnership to 48 before they were parted. Coughlin, on debut, had opened his account on the first evening with four overthrows but showed the quality of his stroke-play with a glorious drive through the covers for four and a hoisted six down the ground. Having made 29 the former Durham all-rounder miscued Sam Rippington to extra cover. Wood hit the same bowler down the ground for four but was left unbeaten on 19 when Jake Ball fell without scoring. Luke Fletcher was absent due to personal reasons, so the innings closed after 117.3 overs, with Callum Guest (3-100) and Rippington (3-120) being the most successful members of the home attack. The reply had only mustered 10 runs before Notts had their first wicket of the season. Vansh Bajaj was pressured into a false shot against the pace of Ball and could only loop the ball into the off-side, where Samit Patel took a well-judged catch. Ball’s opening burst also brought him the wicket of James Park-Johnson. The opener had reached 12 before nicking low down to Duckett at first slip. Luke Wood reduced the hosts to 37 for three when he had Akil Greenidge, son of former West Indies’ opener Alvin Greenidge, taken by Steven Mullaney at second slip for just four. Mullaney then replaced Wood at the Pavilion End and struck with just his second ball, pinning Rishi Patel lbw for 23. Four wickets down at lunch, the students were indebted to a stand of 52 for the fifth wicket before Ball struck for the third time. Ben Seabrook clipped firmly down the leg-side, only to lose his wicket thanks to a stunning full-length dive from ‘keeper Moores. The warm mid-afternoon sunshine corresponded with Patel’s introduction into the attack and the slow left-arm spinner struck three times, removing Josh Cantrell and Callum Guest to lbw decisions, before bowling Luke Chapman. Wood came back to have Jack Keeping caught by Moores and closed out the innings by yorking Rippington. After tea Notts juggled their order, sending out Joe Clarke to open with Tom Moores. The pair put on 45 but then three wickets fell in quick succession. Clarke was bowled by Guest for 20 and then Rippington removed Moores for 19 and Nash for one. After his first innings masterclass Duckett picked up where he left off, brutally working his way to a rapid 50 from only 35 balls. Mullaney followed up a tidy spell with the ball with a stylish half century of his own, getting there from 53 balls with nine fours and a six. Duckett looked to be on course to become only the second county player after Derek Randall to score a double hundred and a ton in the same match but he perished on 82, spooning Keeping to cover. His match aggregate of 298 runs has only been bettered on four occasions though. Mullaney accelerated towards the end of the day, launching Chapman for two huge sixes which clattered into the surrounding buildings. An attempted third was held by Patel, to the relief of the home side. 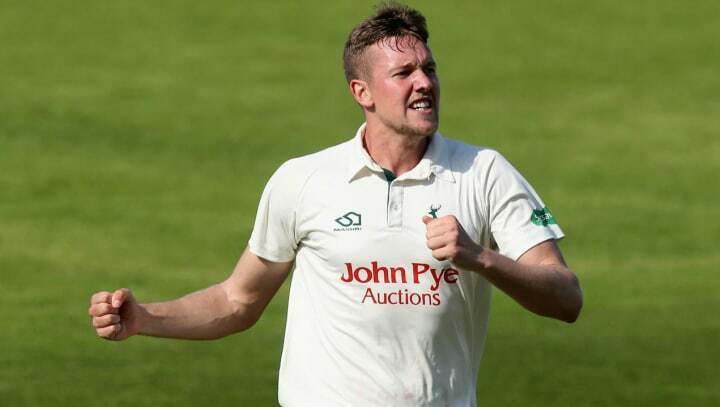 With a lead in excess of 600 Notts will hope for fine weather on the final day as they attempt to round off their pre-season preparations with a victory. The club has, meanwhile, revealed that Zak Chappell is missing the fixture with a minor side injury sustained during the pre-season tour.